When Mitchell Hurwitz's Fox comedy Arrested Development rolled to glory in last year's Emmy Awards (seven nominations and five wins, including Outstanding Comedy Series, Outstanding Writing, and Outstanding Direction), it's likely that the only people who weren't surprised were the show's cast and producers. The majority of average American viewers hadn't ever watched an episode. Arrested Development is a rare case at Fox–a series that's gotten so-so ratings, but has been given a chance to grow and live up to its critical success. The show does need the space. Its complicated characters, baroque storylines, and manic pacing all pack a great deal of information into a small window, and it took some time to fully hit its stride, though last year's DVD release of the entire first season made catching up easy. The sprawling cast centers on Jason Bateman as Michael Bluth, the nominal new head of a once-rich family that falls on slightly harder times when his father Jeffrey Tambor goes to prison for gross financial irregularities. Hurwitz created and oversees the series, which shows a little of the gag-a-minute sensibility he learned as a writer and producer on programs like The Golden Girls, The Ellen Show, and The John Larroquette Show, but finds its own unique vibe in a quick-moving documentary style, with film director Ron Howard as the narrator who holds everything together. While rushing between production meetings for Arrested Development's second season, Hurwitz took some downtime to talk to The Onion A.V. Club about his first TV job, television's grudging respect for writers, and the problems inherent to a unique show. The Onion: How did you first get involved with The Golden Girls? Mitchell Hurwitz: I actually started out of college as a gopher, a runner for a company called Witt/Thomas/Harris Productions. While I was there as a runner, they were doing Golden Girls and this perennial show called It's A Living, which seems like it lasted for about 17 years, but no one quite knows when it was on. And I got to know… One of the best ways into the business is to get a job with a production, which you can do by cold-calling or by getting your résumé out there, and also through contacts. That's where nepotism really helps. My mother had gone to high school with a producer, who got my résumé over to Witt/Thomas/ Harris. It wasn't a very full résumé. In fact, I think I had some student-government-related achievements on there. But that's kind of par for the course, I think, when you're hiring people right out of college. So I got my foot in the door that way, got to know the producers involved, and just started writing spec scripts, which are the calling cards of young writers in television. That's when you choose a show that you like watching, and you write a sample script for it. It's an unauthorized script, and it's not subsidized. You're just doing it yourself, and you get it out there and try to get people to read it. Very seldom do those scripts become actual episodes of the series that you've written it for. And I was no exception. O: Eventually, you were credited as a story editor and producer on Golden Girls. Did you just work your way up inside the show? MH: Yeah. Television is a very writer-driven business, and it's one of the few parts of entertainment where writers are treated with respect, only because they need you. If they didn't have to treat you with respect, they would be happy to dismiss you. But unlike with a movie, they need a new script next week, as well. As a result, a lot of writers have been working their way up the ranks, so a lot of those titles that you see at the start of the show–story editor, co-producer, producer, supervising producer, executive producer, co-executive producer–those are mostly writer titles. There are also some non-writing executive producers who offer creative guidance and do a lot of work with the networks, and that kind of thing. But for the most part, it's a good business for writers, because you're able to develop the same status as a director in the world of film. O: According to IMDB.com, you started writing for The John Larroquette Show in 1993, and your next TV credit is The Ellen Show in 2001. What were you doing in the interim? MH: I was on The John Larroquette Show for about three and a half years, and after that, I created Everything's Relative, which is when I worked with Jeffrey Tambor for the first time. Then I had what was called a development deal at a company called ATG, which was Mike Ovitz's television company. I developed pilots for them, and supervised some existing programs they had that I'd rather not put on the IMDB. [Laughs.] The Ellen Show had a first incarnation as a variety show, believe it or not, so I did The Ellen Variety Show, which was an odd choice for everyone involved, including Ellen, who doesn't do voices and doesn't play characters. She just plays Ellen. She's kind of the Kermit of The Muppet Show. O: Did the shows you worked on before Arrested Development strongly influence your comedy sensibility or writing process? MH: Oh, definitely. You know, The Golden Girls was a very unusual show to start on. I was young, and it was a show about old people, and it was a very traditional show, but it was also an amazing training ground for a joke-writer. It forced me to learn those skills. Larry Gelbart once said, "Your style is formed by what you can't do." When I was doing that show, I didn't think of myself as a hard joke writer, and that's what that show did really well. As a result, my style became more intricate storylines, callbacks to references earlier in the script, tying things together in unusual ways, all covering up what, at the time, I thought was a deficit at writing hard jokes. O: Fox seems to have a house style for its comedies, with a frantic, upbeat, fast pace. Were you ever pressured to conform to any kind of tone or flavor? MH: Not at all. In fact, it's almost just the opposite. They often say, "Can you slow it down a little bit?" [Arrested Development's style] really wasn't so much a move to make Fox happy. It became the style of the show to try to service all the characters and have all the stories intertwine. It was a style that I kind of developed over the years. I had done it with Everything's Relative, and so I think it was a little troubling to them how much story and how much production was in every show. It became a very expensive show very quickly. When I was on The Golden Girls, we'd have eight scenes per show. And when Seinfeld came along, they went to, like, 30 scenes a show, which was revolutionary. Arrested Development has probably got 60 scenes per show. It just keeps emerging as this more and more complex thing. I always try to keep it very simple at its heart. Just have a very simple story for the Michael character, Jason Bateman's character. Then let all the other character stories start and end in the same place. But I typically try to keep them all on some sort of similar path, so it doesn't get overwhelming. O: Is it true that David Cross and Jeffrey Tambor's characters were both meant to be short-term? MH: Yeah, they were, actually. I was going to try to get Ron Howard to call in a favor, to call one of his actor friends, Robert De Niro or something, and get an actor just for one episode. It was just too presumptuous to do. So I never cast the part of George Sr., I just kept putting it off. We were only, like, two days from shooting, and I called Jeffrey Tambor, who I had worked with on Everything's Relative, and said, "Could you come in and work on this thing tomorrow just for five hours? And you'll never hear from me again." He did, and of course you see that pilot and he's such a central part of it, so the network said, "Boy, if you could get him on the show, it would go a long way toward getting this thing picked up." David Cross, too. David Cross didn't want to do television. He really avoided it. We were really lucky, because he really responded… to the money we offered. The script factored into it, but, boy, he really perked up when he heard about the money. O: The dialogue in Arrested Development feels very immediate. It's almost an ad-libbed, Christopher Guest-movie tone. Do you ever let your actors ad-lib? Are you actually shooting for that kind of feel? MH: We really do try to make it sound naturalistic, although we're writing a lot of set-ups and punch lines. Something about not waiting for the laugh of a laugh track allows you to take lines that otherwise might be seen as just direct jokes, and make them seem realistic. The style of the show that has emerged is broad comedy done very dry. We throw a lot of the jokes away. So it feels improvised, but we really do write these out. We write in the overlaps often. We write in the stutters sometimes, if that's important to a scene. Then, that said, a lot of the people on our cast–Will Arnett, David Cross, and Jason Bateman are really good at adding to the dialogue, and spinning things, and coming up with pieces here and there. But it's a very tightly scripted show, because we're trying to accomplish so much in such a short amount of time. O: As a creator with a team of writers, how do you deal with the problem of giving complicated characters a consistent voice? MH: As a show-runner, ultimately all the voices have to go through me, or through whoever is in charge, whoever is running the operation. What we often do is write the scripts all in one room, with the senior writers, or sometimes more than that, all sitting in the same room together. Oftentimes, I'll be at the computer keyboard, and we'll just go through the script from start to finish off of a detailed outline, and make decisions about who would say what and when as we go. The easiest part of it is keeping their voices consistent. The actors bring such unique twists to these characters, and we have such complex characters, that that's the fun of writing the show. You get to play in their voices. I wouldn't really think of that as a challenge–it's more the fun of it. "What would Gob say?" O: Arrested Development has been a critical darling, and it's sold well on DVD. But it's been something of a ratings problem. Do you have any theory on why it doesn't attract more viewers? MH: No. We're doing okay. It always seems that the ratings haven't matched the press that we got. But just for a regular show, we're doing fine. It's a different kind of show. We really aspired to do something that wasn't on TV. And when you do that, you quickly discover there's no lead-in, because your show's not on TV. The shows that do well typically have good lead-ins that are well-suited to the same audience. The Simpsons is definitely better for us as a lead-in than Malcolm In The Middle was. But it's still a slightly younger audience than I think the show does well with. Our hope is that we just stay alive long enough that people discover it, and word of mouth develops, and that kind of thing. We're just putting everything we can into it. So I really have no theories why it's not working better. But on the other hand, it's working as well as anything I've ever done. So it's all new to me. O: You're doing a series with an ongoing, developing storyline. Do you have long-term plans for many seasons out? Do you think in those terms? MH: No. We kind of like the audience to think that we do, but we really don't. We kind of make it up as we go along. We will have certain place-holders in the show. One of the writers, Jim Vallely, last season suggested that maybe we can find out that George Sr. was building model homes in Iraq for Saddam Hussein. Since we knew that early on, we were able to put a lot of clues to that. Sometimes we put in clues first and get to a story. Like with the Carl Weathers thing, we'll just have a joke, and over the course of writing the thing, we'll turn it into a storyline. The fun of it is trying to make it look like we know what we're doing, but we really don't. We're just figuring it out as we go along. O: Do you have other ideas you're working for the future? MH: Not at all. I will when this stops, but this is such a full-time job. We work on this nine days a week. A few of the writers, Jim Vallely and Chuck Martin, will work seven days a week with me. Plus there's a lot of time in post, and a lot of time on the stage. We shoot every day. The job really is a 10-day-a-week job, but of course there are only seven days in a week. So we're just constantly behind, constantly trying to catch up. There really isn't time for anything else. It's also just the greatest comedy training we could ever have. Because we're being underwritten in this endeavor to really try different, funny, creative stuff. It's really a privileged position to be in. So we just want to make the most of it. The Onion: So you've got producer credits for The Golden Girls, and executive producer credits for Everything's Relative, The Ellen Show, and obviously, Arrested Development. Was there any consistency in your role on these shows? 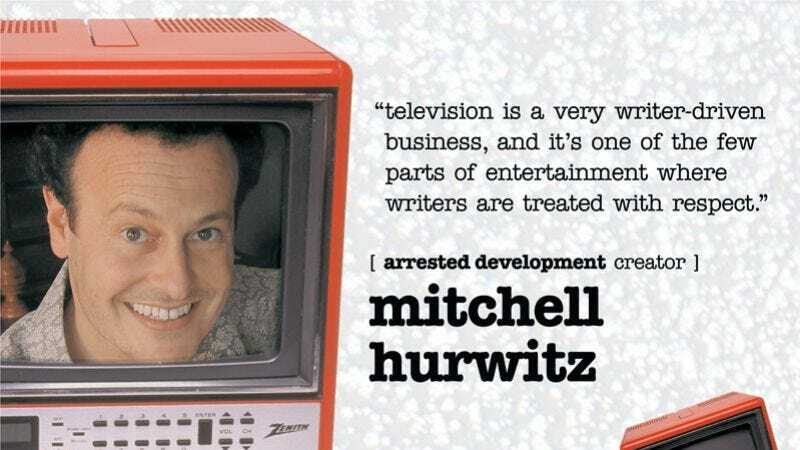 Mitchell Hurwitz: Yes, those are shows that I created, with the exception of one you didn't mention–The John Larroquette Show. I didn't create that; I came in and became what was called the show-runner, which is often titled as "executive producer." It's the person who's running the whole enterprise. It's funny, you do work your way up in the business, developing your comedic voice, and all of a sudden, you're in this position–as my friend Jim Vallely likes to say, you're running a mini-mart in addition to writing these scripts. You're supervising the design of the sets, the casting, the editing, which is a huge part of it, and you're dealing with the networks, you're dealing with the studio…So the "executive producer" title either means that you're the person who created, or co-created, the show, or you're the person who's in charge of day-to-day operations. Whereas "producer" is often just a writing credit; it says to the industry, "This is a writer who'd had this much experience, he's up to this level." So the title of "executive producer" is much more than writing, especially on the show I'm doing now. It's much more than just writing the show, because the physical aspects of production are so demanding. There are directors who are brought in each week, so they're not as familiar with the show as the executive producers and the writers are. So you're supervising the stage, and you're kind of the head writer, and you're also in charge of post-production and network relations and that kind of thing. It's more than a full-time job. O: It seems like there was a lot of pressure to make The Ellen Show different from Ellen. What was writing for that series like? MH: It was challenging. It was a very different thing from what I'm doing now, because it's really writing for a star. It's a different creative exercise. When you're writing for someone like Ellen Degeneres, it's really their show, much more than it's the writers' show. It was a much more workmanlike proposition. I was trying to accommodate what she wanted to do on television, and get into the dynamics that she wanted to explore. It was something that I never really thought I would stick around with; it was something I was getting off the ground for ATG, and I ended up staying with it for the full year. But it's very different than Arrested Development, which is really a purely creative endeavor. It starts with the concept, the idea, and the characters. There isn't one distinct star kind of running the operation. O: What was your process like when you were developing Arrested Development? How long was the idea brewing? MH: I had developed an idea that was fairly similar, and was kind of a rip-off of a J.D. Salinger short story–it took place in New York with this intellectual family. Then The Royal Tenenbaums came out, and I thought, "Well, that's it, I can't do that anymore." About a year later, I got a call from David Nevins, who's president of Imagine Television. I had worked with him on Everything's Relative. He said Ron Howard had this idea to do a single-camera comedy that was as funny as a multi-camera comedy, which sounds sarcastic, actually. But there are two forms of television comedy: There's multi-camera, which is a show in front of an audience. You read the script to the actors on Monday morning, you do a run-though on Tuesday, a rewrite that night, another run-through on Wednesday, and another rewrite. You go through this process every day of the week, until you finally put this thing on its feet in front of an audience on Friday night. But in that process, you're really vetting the comedy. You're out there in front of a small gathering every day, hearing what gets laughs and what doesn't. As a result, we often think of those kinds of sitcoms as being jokier, but really, there are more jokes per second, per page, than there are on a show like Sports Night, where there wasn't an audience, and there was no compelling reason to rewrite. His question was, "What if we shot a show in digital video, so we could go very fast and didn't have to spend an hour and a half lighting for each shot, we could just go out there and start shooting, like Cops or Blind Date? Could we spend that time sharpening the jokes and making a more ambitious production? What would happen if we applied the sensibility of multi-camera to single-camera?" The answer, as it turned out, was that Mitch Hurwitz didn't get to see his family. At all. I mean, I get pictures by e-mail. It's ridiculous. But that was the idea, to do a really funny single-camera show. The office said, "Well, these single-camera shows aren't funny; they're interesting, or they're quirky, but you're not laughing out loud." So we, as a group, decided to make the show about a family, and from there I started developing these characters. I pulled a little bit from this other idea I had earlier, from the show that took place in New York. I knew I wanted a show about rich people who lost their money, and had never really developed as human beings, because they had money. They were enduring this hangover in their lives, and were being forced to downsize and get to know each other. Then I started building up from there. A lot of writers use tricks to help them write that aren't always evident in the finished product. Originally, I conceived of it as a very conservative brother and a very liberal sister. That's a very small part of it now, actually, but it was one of the things I had when I started. I also had this idea–I'll give you all the details, because I assume there are students reading this, and if you're not a student, you can skip this part, because it's incredibly boring. Someone told me once about this paradigm that exists: matriarch, patriarch, craftsman, and clown. It's this quartet that resonates through history and popular culture, and you can find it as a diagram in everything from The Beatles to Leave It To Beaver to Seinfeld. In The Beatles, you can kind of see it the clearest. You know, Paul is the matriarch, John is the patriarch, the craftsman is George and the clown is Ringo. So I wanted to get that in there, and I thought, "Maybe that will be the four kids. I'll do a show about four kids." As it turns out, Michael and Lindsay would be the matriarch and patriarch. The craftsman, to me, is Buster, because he's a scholar and he's serious, and the clown is Gob, because he's a magician, and clowns literally are magicians. [Laughs.] Oh, there are some magical clowns out there. But I don't want to make this an advertisement for clowns. Then, I wanted to show this change of life that happened, and we developed this idea of having a narrator, and suddenly there was a lot of story that I wanted to get out. It kept getting more and more complex. Finally, this outline I gave to the network and directors and everything made so many people say, "This is an absurd amount of information to get into a show." The family was in the housing business, they'd gone bankrupt, and before they'd gotten into the housing business, they were in the frozen-banana business… There were just layers on layers. And everyone had two or three attributes. The magician who was kind of macho was also the weakest. And he rode a Segway, as this extra unnecessary thing. He'd just been kicked out of a magician's alliance that he'd founded. There was an enormous amount of backstory for all these characters. And it was a very difficult project to write. I mean, it was nauseatingly difficult. I was in new territory, I didn't know what I was doing. The scripts have to be shot at about 31 or 32 pages to even make it on TV, and I think my first draft was about 60 pages, and I still hadn't quite gotten out all the information I wanted. Lucille II was in that first draft, which became the Liza [Minnelli] character. So it was a very ambitious thing, and sort of set the template for how we do the show now, which is just overwrite it, and boil it down and reduce it until we get the densest 32-page script we can. Then we end up with an edit or a cut of the show that's about 27 minutes long, and these things end up on TV at about 21 minutes long. The show is 21 minutes long! Which is so much shorter than the amount of time you and I have been talking. O: Once you made the decision to include a narrator, how did you end up with Ron Howard? MH: He's the co-founder of Imagine Entertainment, and he's the one who kind of started this idea. And he's got such a great voice. I was talking to him mostly on the phone, because he lives in Connecticut. It seemed like it would be a great way to play against what was emerging as a very frantic half-hour, with his calm, familiar, trustworthy voice. We wanted something that was not judgmental at all. He could say things like "Tobias boarded a van full of homosexuals…" with no spin on it. It was also kind of a manipulation, because one of the ways we got through the door at Fox with this unusual idea was because of Ron–not only his clout, but his creative judgment. He was very involved in every stage of the writing process. I'd finish a draft and get it to him, and he'd have ideas and suggestions. That was of great value to the network. It was just a manipulation, in a way. Because it was like, "If we could get Ron to do the voiceover, if he can do the narrator, then he would, by its very nature, be involved in the show every week. Even though he's going to want to go back and do his movies, he's going to have to be involved with this show, which is going to make the show better. It's also going to raise the profile of the show to the network." Because at this point, it was just a pilot. We weren't making a series at the start. So there were things like that that I was just doing to stack the deck in our favor. Including the "On the next Arrested Development…" Which is a very presumptuous thing to put at the end of the pilot, because it's just a pilot. So the people screening it in New York, the advertisers, think "Oh, is there another one? I didn't realize we'd made this decision yet." But it also upped the test scores. One of the questions they asked of the test audiences after they screened the pilot is "Would you see it again?" It was a great way to get those numbers high. It was like, "Oh, I have to. There's another one coming." O: Besides Jeffrey Tambor and David Cross getting ongoing roles, were there other changes that got made to the series early on, once you started doing tests and seeing how people reacted to it? MH: There's this weird thing that happens where they screen the shows, and they want you to watch the screening. It's really just what you'd picture. They put the audience on the other side of a one-way mirror, and you watch them watch the show. If you've never watched people watch television, I don't recommend it. It's not an exciting thing to do. They hold this knob, and they turn the knob to the right when they like something, and to the left when they don't like something. Can you imagine this standard being applied to any other thing? Eating, or listening to music, for instance? It's not like the brain is that finely calibrated to pleasure. So they'll watch, and within a joke, they'll start not liking something, and then they'll see Tobias walking in a pirate outfit, "Now we're happy again! We're happy again!" Then there will be a little dull moment where maybe Tobias gets in the van, and they're not that happy, but then they'll see Tobias out on the boat, and they're happy! And then they take the aggregate of these scores and say, "You got a seven." It's a crazy system. Then everybody sits together and says, "Oh, we got a seven. All right, we got to cut. We got a problem. Can we cut the part where he's in the van?" As a writer, as a creative person, you say, "Guys, I don't think we can just keep the peaks." It's a very common thing in entertainment. That's why a lot of movies suffer. It's like people having dinner and saying, "Boy, that dessert was good." "I thought so, too!" "Well, can we start with the dessert?" "Let's start with the cake, then bring out the salad." "Boy, the salad is testing badly now." "Let's bring out another piece of cake!" Then it's like, "Let's bring some heroin in. The cake isn't doing it anymore." So you get these awful… As a creative person, you try not to be too defensive about that stuff. You want to listen. What do people think? You'd rather have it be your peers and friends, but you think, "All right, let me suffer the insults." Then you watch as they discuss it. "I thought it was kind of stupid." And you're sitting on the other side of the glass nodding at something somebody called stupid. Something you worked on for the last six months. "Good. Good note!" Then as they talk, "It was just dumb. I don't know, when they got on the boat, that was pretty funny." And by the end, they were all talking about how funny it was. But what did emerge was that they didn't quite get the end of the show. The end of the show didn't quite work. We had a scene that was up in the attic between Michael and his sister, and it just played very dramatic. It did seem like, "Wow, we're really taking ourselves seriously." It was hard to decipher that note from their reaction, but it did emerge. So we re-shot that scene in the pilot, and that ended up being Michael and Lindsay sitting on the step of the house, and Lindsay trying to force herself to cry. It was clear with that scene, "Okay, we're not taking ourselves that seriously." I put in a lot of lines about Michael saying, like, "We're a horrible family." He says at one point, "You can all live here. I mean just you. Not Gob. And not Buster." And it was like, "It's okay, we're not that nice." And it helped. It really changed the tone of the thing. So in that sense, the process helped me. But it was demoralizing. O: Michael's behavior toward his siblings and his parents seems very moral and upright, at least by comparison. But his behavior toward his son is often reprehensible. Was there a conscious effort to make him unlikable in some way? MH: Yeah. Not unlikable, but as flawed as they were, was always the idea. They weren't what they thought they were. Lindsay's character thought she was a liberal, but she never made any sacrifice that cost her anything. It was somebody else's money. She really wasn't a generous person. And Gob, in the pilot anyway, certainly considered himself a family man. He was with this woman that had children. But he really wasn't. And Gob considered himself the patriarch of the family, but of course he didn't do anything. Michael considered himself a family man, because he was on the path his father was on. He was going to take over the family and be the leader of the family. But again, it didn't represent any sacrifice. He didn't have to take care of anybody. So suddenly their lives changed, and Michael had to truly take care of people. We wanted to make it clear he wasn't noble at all. That he, too, was a fraud. And that he, too, was discovering, "Oh, this is more than just image." The hope was that this loss in status would make them better people. And to do that, we had to make sure they weren't good people to start with. They've all got really good hearts and they're all very vulnerable, I think. But, yeah, Jason is definitely very Type-A and very full of himself. If anything, I was emulating The Sopranos with a lot of the show. Talk about a flawed character. We see Tony Soprano not only have affairs behind the back of a character we really like, but actually kill people, and we still kind of feel like, "Ahh, poor Tony. Poor Tony!" [Laughs.] That's really the question: What can you get away with? How far can you go with making characters, let's not just say unlikable, but flawed, and still have them be appealing? O: How did you get Liza Minnelli and Henry Winkler involved with the show? MH: I had this character of Lucille II in the pilot. The idea was that Buster, who had been coddled his whole life, was finally going to emancipate from his mother and move out and move six feet down the hall into the adjoining apartment of another woman named Lucille. We had this character, and we wanted her kind of dramatic and pure. One of the writers, John Levenstein, suggested Liza Minnelli, who he was trying to get for a pilot at one point. We had a hard time finding her. She didn't have a theatrical agent. I think we ended up calling Larry King's office to see if he knew her publicist. She was in town, in Los Angeles, and I met with her and told her about the part. She didn't know anything about the show. Really, we'd only done the pilot, so she didn't know…It's a hard show to explain in a short amount of time, and then to talk about her character and how she was going to be involved with this 29-year-old and have vertigo, and he had panic attacks, and together they were going to overcome their afflictions… I was a little nervous that she wouldn't be into that. But she just jumped at it. She loved the idea, and really wanted to play as flawed a character as possible. O: The character seems a little self-mocking. You don't tend to think of Liza Minnelli as doing that very broad physical humor. MH: It's funny. She's such a gifted comedian. We all knew that, and we all forgot that. You see her out there nailing these lines as we're making the show and we start remembering all her work. That she got an Academy Award for Cabaret, and she was so brilliant in The Sterile Cuckoo and in Arthur…She was hilarious. She just a really, really funny, fun lady. With Henry Winkler, we all grew up just loving Henry Winkler and loving Fonzie, and kind of forgetting, just because of how old we were when that show was on, how hilarious he was, and what a breakout comic actor he was at the time. He quickly took on this iconic position as this really cool character, but in fact, he's just a really, really gifted comic actor. It started with, "Wouldn't it be fun to have Henry Winkler play this sleazy character?" He has just gone further and further with it with us. It couldn't be further from Fonzie, and yet it's just as natural to him as Fonzie was. One of the great highlights of working on the show has been working with Henry Winkler. He's such a funny guy, and such a great guy. O: What about Carl Weathers playing himself? How did that happen? MH: Carl Weathers, we had in a script. One of the writers, I think Brad Copeland, had a line in a script about how Tobias had been off at a stage-fighting workshop with Carl Weathers, trying to take his craft seriously. Later on, an episode came up where Tobias was going to go try to reapply for his medical license, which he lost before the pilot started. We wanted one last temptation to come along in the world of acting. So we had this idea, "Well, let's have Carl Weathers, because that's the guy we established." So I called Carl Weathers and said, "Hey, would you be interested in doing this?" He said, "Well, yeah, but let's give me a character." In fact, I think all we wanted to do at the time were Rocky jokes, which we ended up doing none of. We just wanted to have Carl Weathers as his trainer, like Rocky. It wasn't the most complex joke. Carl Weathers was the one that said, "Well, if I do this, can we give me a real character? Can I be really cheap or something?" Which I just lit up at, you know? It's like, "Oh, absolutely! We would love it if you were cheap! We can make you incredibly cheap!" So when we meet Carl Weathers, he's on his way to get bumped from a flight so he can get a free airline ticket. He talks about how it's this crazy loophole in the system, and he just gets cheaper each episode. He's back this year. He hasn't been on yet, but he's got a part in a biopic about the Bluth family, and he's playing the role of Ice, the bounty hunter, who we established earlier in the season. So he's playing the part of someone that we saw two episodes earlier.